It was around half an hour’s drive to the border where there was some hold-up on account of the border official insisting that our car was stolen. In the end the official conceded that the car was grey, gave our passports a desultory look and we were let through to Albania, land of Enver Hoxha pillboxes. We drove on to Kukës, a rather hideous town, whose most salient feature was a statue in the main square of a martial partisan Amazon, chest slung with cartridge belt. The old town of Kukës had been submerged during the building of a reservoir and you could still see the tiled rooftops poking through the water. Somewhere around here the UÇK had trained Luli to fight the Serbs during the war. From Kukës I clutched my seat, pressed my nose against the window and tried not to vomit as we took a spectacularly winding road up innumerable switchbacks under snow-capped peaks and along steep precipices through the mountains several hours to the Catholic town of Rrëshen, where we stopped for lunch. The climate was milder. Though still in the mountains you could kiss the air it was so sweet, feeling that the Mediterranean wasn’t far. The food was good. In a spacious restaurant with white-washed walls where we were the only guests, we ate succulent boiled lamb and olives. We continued on towards Tirana, passing by many a ruined factory, destroyed and gutted during the general anarchy which erupted in Albania in 1997 following the collapse of the pyramid schemes, when Albanians destroyed everything which bore an affiliation with the Communist regime, perversely destroying in many instances their own sources of livelihood. Almost a sixth of the population invested around $1.5 billion in get-rich-quick capers, selling their houses and land to join the gold rush. The ruling party both endorsed and profited by the collective euphoria of this manic speculation. As the schemes failed, Albania erupted into armed unrest, with riots in the streets and demonstrators burning government buildings, ultimately resulting in all-out civil war. Along the way we passed many an old model Mercedes on the road. “Welcome to the land of Mercedes Benz,” I said. “Or at least where Mercedes Benz goes to retire, ”said Ivanović. 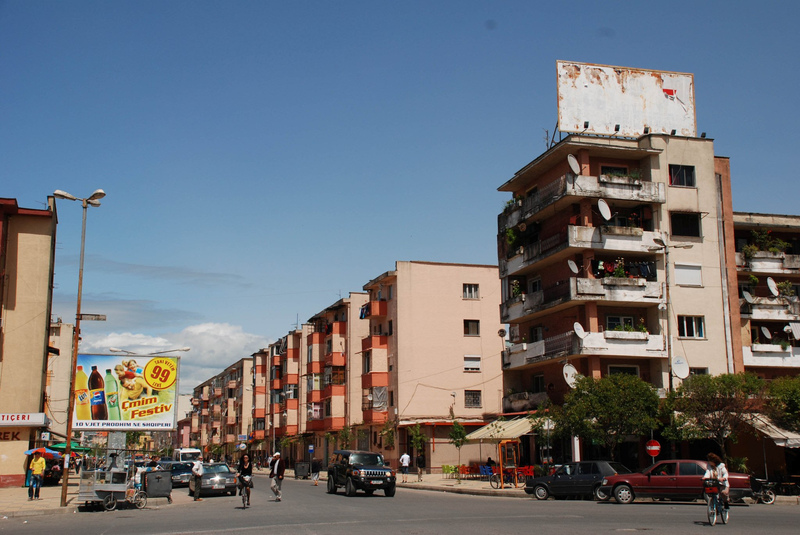 Ten years ago there were hardly any private cars at all on Albanian roads. Before 1990 it was illegal to own one here. Then, as soon as borders opened up began a flourishing trade in hot vehicles smuggled in from abroad. 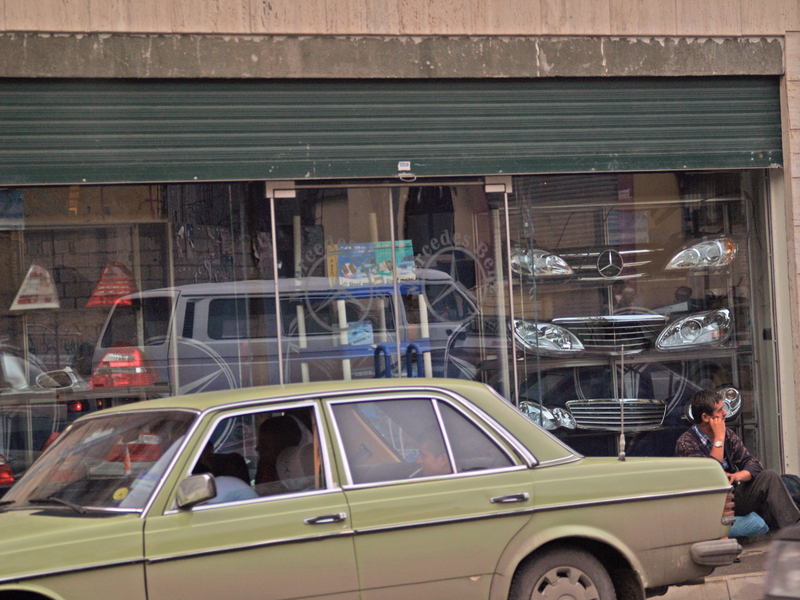 It is common knowledge that Albania is destination number one for stolen cars from Europe, especially Germany and it made me wonder how many of these cars were of dubious provenance. “Do you think a lot of these cars are hot?” I asked Luli. Be that as it may, it was clear that there were a lot of cars from Germany on the road, and it reminded me of something else. On a previous visit to Albania I found myself in a south Albanian town south of Pogradice on Lake Ohrid. Walking around the bazaar quarter I remarked to myself that everyone was carrying their purchases in plastic Lidl supermarket bags. There is not a single Lidl supermarket in Albania. Someone was obviously making a small business with these plastic bags imported from Germany. Back in Berlin I found myself one day in a Lidl supermarket. “Can you believe it?” asked the check-out lady. “Someone, and I would very much like to know who it is, is stealing mass quantities of our plastic bags.” It occurred to me this could only be an Albanian. We drove on through the mountains. There were rubbish tips everywhere. It was obscene the amount of trash that was dumped carelessly on the peripheries of towns and villages with absolutely no heed paid to the picturesque landscape. There is trash everywhere in the Balkans, but somehow the situation is more extreme in Albania. Everywhere you saw the ubiquitous blue plastic bags which everything comes in in Albania. Back in Berlin I was with an Albanian and a German. The German had tried to drive into Montenegro with a rickety old bus and had been prevented from entering on account of the bus did not have the proper emissions standards. What had sufficed for Germany evidently wasn’t up to par in Montenegro. “They want to make Montenegro an environment-friendly country,” said the Albanian. He had a point. Still the rubbish irritated me. Finally we arrived in Tirana and immediately got snarled in traffic. Faded, pastel colored, paint-chipped Mediterranean tenement-style apartment blocks lined the main arteries. The traffic surged in fits and starts. Bumper-to-bumper, we drove up streets cluttered with messy shop-fronts selling a motley array of wares, Balkan style. Laundry hung out in festoons from iron railing balconies. There was the odd mosque. It stank of exhaust. We drove around Skenderbeg Square, a wide open platz at the center of which stands an equestrian statue of the valiant fifteenth century Albanian hero, Skenderbeg with Albanian flag flying. A decade ago Tirana had no traffic lights, save a couple decrepit and broken lamps hanging here. 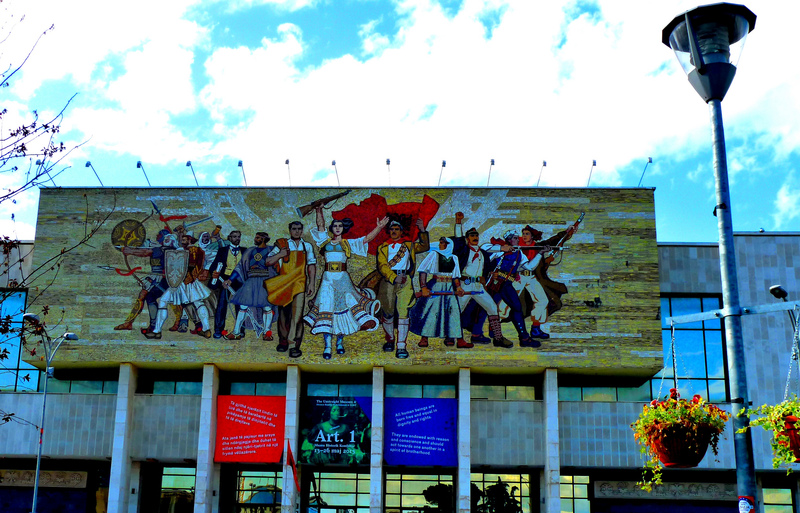 On the north end of the square is the National Museum fronted by a huge mosaic depicting various figures dressed in the traditional costume of the various Albanian tribes, in addition to characters in proletarian garb striding forth into a bright Socialist future. Albania, we were to find, was full of very fine examples of Socialist Realist art. Mosaics, in particular, appear to have been a specialty. Not far from Skenderbeg square we pulled into the lot of the National Gallery, where the next day Ivanović was scheduled to meet with the director. From the National Gallery we walked along the uneven pavement to our bed-and-breakfast run by an elderly woman clad from head to toe in black with a large mole on her chin. We deposited our things in the pension and set about catching a bit of Tirana nightlife. It took a bit of searching, but after walking up and down a lively street lined with a lot of Italian-style cafes we eventually found an appealing locale, had a drink and set off for something a bit more bohemian. Ivanović recalled an artist-haunt from a previous sojourn in Tirana. After an expanding square search we eventually found it to be closed. After further aimless wanderings – it was now nearing midnight and the stray dogs had taken over the empty streets of Tirana – we found ourselves in the bazaar quarter, where we entered in Italian restaurant. We were the only patrons and we proceeded to order raki. Raki, though bearing the name of the famous Turkish anis based drink, merely means schnapps in the Balkans. In Serbia rakija is primarily šlivovitz, or plum brandy. Here in Albania raki is made from fermented grapes and has a harsher, grating taste verging on Italian grappa. We were in the mood for a bit of conversation. Pavel recounted a story involving a Japanese girl in Prague who went into a restaurant and ordered fish, dumplings and a beer, not knowing that fish never went together with dumplings. When Pavel addressed her, asking her why she had ordered what she had, she responded saying that she wanted to sample a Czech dish. She knew that knedloveprozelo (dumplings, pork and sauerkraut) was a typical Czech dish, however she did not like pork, so took fish instead. This offended Luli’s Albanian sense of honor. “It’s immoral what you did,” said Luli. It is remarkable that even the intellectual Albanian is touched by the criminal milieu. For hadn’t Luli told me before that he had moved in the company of Albanian thieves in the Czech Republic? Albanians stick together. If you are an Albanian living in a small city abroad chances are you have contact with other Albanians, and there is a good chance that some of those Albanians are criminals. And if you know criminals then you know that criminals have their own morality. “But doesn’t that destroy your argument about the Gypsies having it good in Serbia?” said Ivanović. No conclusion was reached. Another round of raki arrived. “To the Gypsies,” said Pavel. “Who have it better than us anyway,” said Ivanović. It was getting late. The restaurant was being kept open just for us and the waiter clearly wanted to go home. He had already been on he verge of closing when we walked in. So we paid and left, walking back to the pension along deserted streets, stopping along the way at a tacky nightclub for another drink. They didn’t have raki, which was proving to be our drink of choice in Albania. Many posh Balkan joints don’t sell raki because it is cheap. Luli inquired after the red wine, asking the bartender if it was Albanian wine. It was not. A small argument ensued. We drank an expensive gin and tonic, sat in silence in the darkened club and left. The next morning we had breakfast of omelets served by the old woman at the pension and left for the National Gallery, where Ivanović had an appointment with the director. The museum was closed to visitors. While Ivanović spoke with the director we whiled away our time in boredom, unable to see the exhibitions. Pavel and I had a coffee in a neighboring café among gesticulating men speaking heatedly in Albanian. Then we went for a stroll around Skenderbeg square. It was one o’clock. The faithful were gathered for mid-day prayers in front of the Ethem Bey mosque kneeling on carpets and bowing to Mecca. Enver Hoxha, in his Banner of Struggle for Freedom and Socialism (1985), wrote that his Communist regime would “free the people from backwardness, from the shackles of the patriarchal canons, prejudices, religious beliefs and divisions and all the decay of the past”. The regime continuously emphasized that Catholicism, Islam and Orthodoxy were alien philosphies introduced into Albania by foreign elements which essentially threatened the integrity of the nation. Priests and muftis were ridiculed as backward relics of the past, easily recruited as agents of foreign powers to undermine Albanian nationalism. Thus Hoxha hoped to appeal to the Albanian people’s strong sense of national identity and their deep suspicion of the intentions of foreign powers towards their small country. The decisive blow dealt to religion in 1967 by the enforced abolition of all religious practices was intended, according to Hoxha, to give the Albanian people a ‘spiritual emancipation’. It can be argued that Hoxha outdid even Stalin and Mao by officially banning the practice of religion and the sale of religious books and icons. Up till 1967 Albania had about 1,200 mosques, 400 Catholic churches, and more than 300 Bektashi tekkes. In the 1967 cultural revolution the majority of these buildings were either destroyed or turned into warehouses, sports halls or cinemas. In the mosques concrete was plastered over prayers written on the walls, and in churches icons were destroyed and frescoes painted over. Although some of the smaller mosques and churches were totally demolished, those religious buildings which were of great historical or architectural interest, such as this one, the Ethem Bey mosque, with its graceful minaret, were preserved as part of the people’s traditional heritage. Secular festivals were substituted for the traditional religious ones, and a museum of atheism was set up in Shkoder, the town Hoxha considered the most religiously conservative. Yet although Albania had proclaimed itself the world’s first toally atheist state, it could not eradicate all religious beliefs and practices, but merely drove them underground: young boys were secretly circumcised, mass was celebrated clandestinely, and many continued to listen to religious programmes broadcast by radio stations in Italy and Greece. Back at the gallery, the director, who had concluded his discussions with Ivan, gave us a personal tour of the museum, guiding us through a temporary exhibit from a private Italian collection featuring many fine works by De Chirico. Upstairs were the permanent works. Aside from some very nice early twentieth century landscapes and oriental motifs there were two rooms devoted to Socialist Realism, one room with sculptures and with paintings. It struck me, and not for the fist time, that there was some very good Socialist Realist work in Albania, and unlike in Germany, it is not kept embarrassedly out of sight in dusty depots, but is presented as a natural and integral part of the country’s art history. Then it was time to leave Tirana for the Albanian Riviera, where we had planned to spend the rest of our stay in Albania. We picked up our bags and drove west on the highway to Durrës, where we stopped for lunch at an Italian restaurant on the water. Here again Luli made an incredible scene about being served Italian wine. Albanian wine was promptly served and Luli was pacified. From Durrës to Vlorë it was about a three hour drive. It was dark when we arrived in Vlore. Palm trees lined the wide avenues. I rolled down the window letting in the soft Mediterranean air and the sonorous muezzin timbres wafting from a palm encircled Turkish mosque. We drove south along the seashore in search of a hotel. Phosphorescent surf crashed on the beach. One hotel we stopped at did not have rooms with an ocean view, so we moved on until we found a hotel that was to our liking, had fish and calamari and drank white wine on the terrace overlooking sea-grottos and listened to Pavel tell funny stories about Czech prostitutes and drinking with Russians. Meanwhile Luli pointed out the differences between north and south Albanians. Luli was a Gheg and a north Albanian, like all Kosovars. Here in Vlore we were among Tosks – south Albanians. It was a bit like a north German in Bavaria. South Albanians were an inferior race, in the eyes of Luli. I asked Petrit what the southern Albanians thought about northern Albanians. The next morning from our hotel balcony I rubbed the sleep from my eyes and stood watching a worker shovel dirt from the hillside under the highway onto the beach. From our hotel south of Vlore we drove an hour down the coast to the so-called Albanian Riviera, to our seaside resort Dhermi, soaring up to a misty pass through pine trees only to drop down again to long switchbacks which took us down to the water. The landscape was marked by steep, snow-capped, cloud-shrouded mountains more than 1,500 meters high, plunging down to long stretches of sandy coastline. 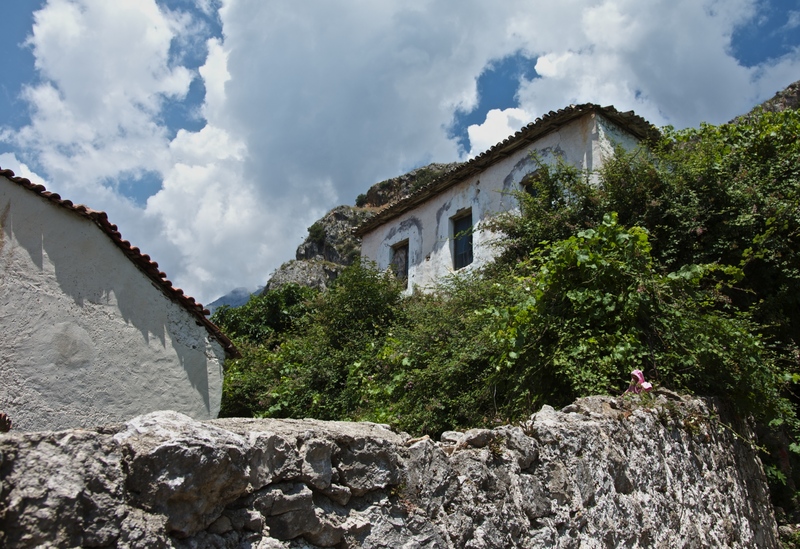 Small villages clustered around the winding road, the house fronts scrawled with Greek graffiti, urging people to vote for the Greek party, for there was a sizeable Greek minority here living in island enclaves in a sea of Albanians. There are estimated to be 750,000 Orthodox Christians in Albania, and alone of Albania’s four main religions the Orthodox Church is closely linked with the Greek minority in the south of the country, which is home to 35,000 ethnic Greeks. Many ethnic Greeks and people with some Greek blood held leading positions under the communist regime. Again the touchy Balkan issue of nationality. For Luli, if it wasn’t the Serbs it was the Greeks. But never the Americans. You can not in this world find a more America friendly people than the Albanians. 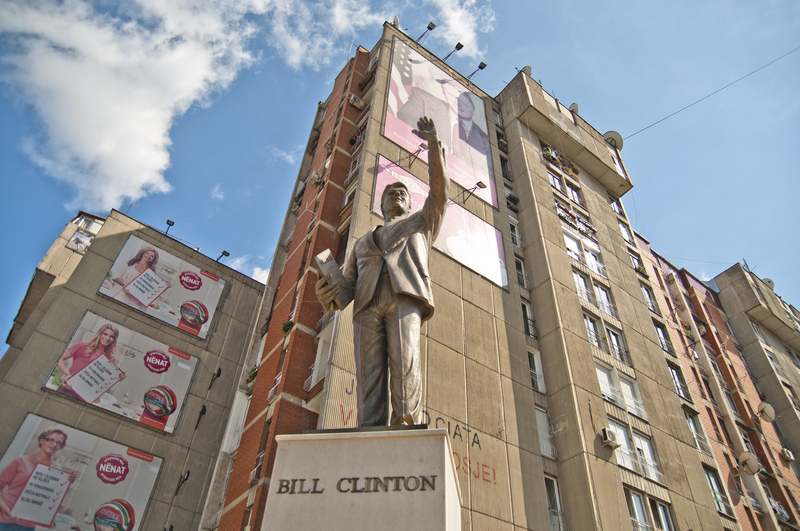 In Prishtina there is a Bill Klinton Boulevard, upon which is to be found Bill Klinton Döner Kebab, which stands alongside a kiosk advertising itself as Boutique Hillary. Not far away is a hotel which bears a monumental replica of the Statue of Liberty. Nowhere else in the world, not even in Texas, is a George W. Bush autobahn conceivable. But it is in Kosovo. This facet of Albanians pro-American stance was brought out to me again here in Albania, where it is customary to hang alongside the usual Albanian flag, which adorns any newly built house in Kosovo, also the Stars and Stripes. One day in a little village south of Dhermi we sat under vine trellises drinking wine and eating olives with some local men who gazed and threw cigarettes at us. Upon hearing I was American one of the men, a tall, rangy, spike-toothed old gibber, made me sit at his table and asked me if I did not know that the Americans and the Albanians were brothers. “So I gathered,” I said. “And do you know why?” the Albanian asked. I had never heard that one and I wondered if I should argue the point, but thought better of it. They had received us as guests and I didn’t want to make trouble. And so the subject was dropped. The only thing is most Americans can’t really locate Albania on the map. Germany knows a little more about Albania, but mainly having to do with the stolen car racket which operates between Albania and Germany. I had to admit the Albanian-American love-affair was a little one sided. And wasn’t Osama bin Laden also one of America’s friends once? Times change and friends drift apart. It seemed to me just another short-lived Balkan allegiance. But it was touching, at least, this one sided love affair. I have been told that the Albanians now control the mafia underworld in America after knocking off the last Godfather a while back. They are nationalistic to a man. Even the most bohemian, non-conformist, whisky-drinking, joint kiffing diaspora Albanian is a patriot to the core. What’s good for Albania is good for the world, seems to be their philosophy. 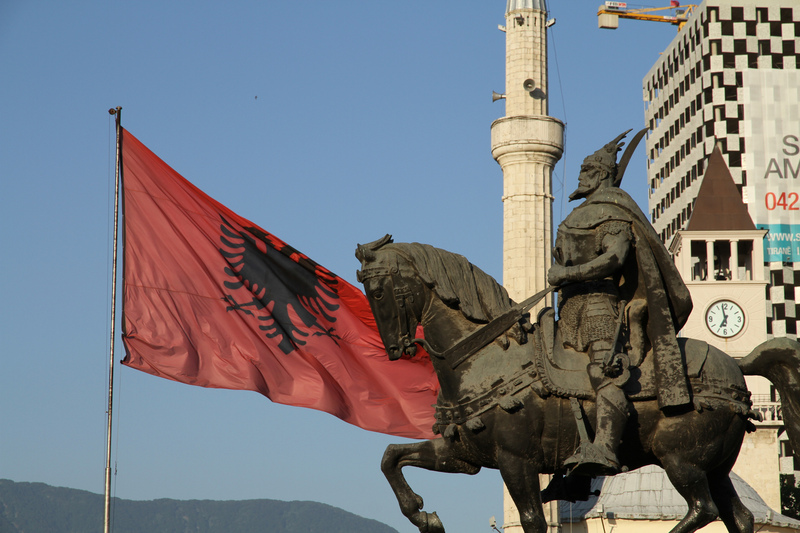 It has been told to me on many occasions that Albanians don’t have a religion; they have Albania. Try to find a German, let alone an alternativ German who will kiss the German flag with loving affection, as I am sure Luli would. We took a road leading from the town of Dhermi down to the beach passing ramshackle houses with cisterns on the roofs and grape vines trellised on the terraces, stopping to allow a herd of goats to pass before us. Down on the shore three or four hotels and one gutted shell of a hotel all clustered together at the bottom of a white pebbly beach at the far end of which stood a scrub-overgrown promontory with a couple of walled ruins perched atop. This, finally, was Ivanović’s hill. We parked the car and scouted out several hotels before deciding upon the Hotel Luciano, a small three-storey hotel with a terrace overlooking the water. “Do you have any rooms?” asked Luli. Double rooms ran twenty euro and smelled of disuse like the resort hotel off season that it was. The restaurant was decorated with a couple pictures of local views painted in sand. A leafy vine ran the length of the wall. Workers sat chatting, drinking Turkish coffee at a table in the corner. Albanian pop folk blared from the speakers. We deposited our bags in the rooms and then sat out on the terrace contemplating the monastery at the end of the beach. “Let’s go take a look at my hill,” said Ivanović. We sat on the terrace and drank our Turkish coffee and then set off for Ivanović’s hill. We drove up from the beach and turned into a rutted road that made the car bounce like never before, till it became so rock-strewn that we had to pull over and park. We scrambled around on the rocks, took a path which led up the hill, stopping a while to eat sour oranges from the trees. 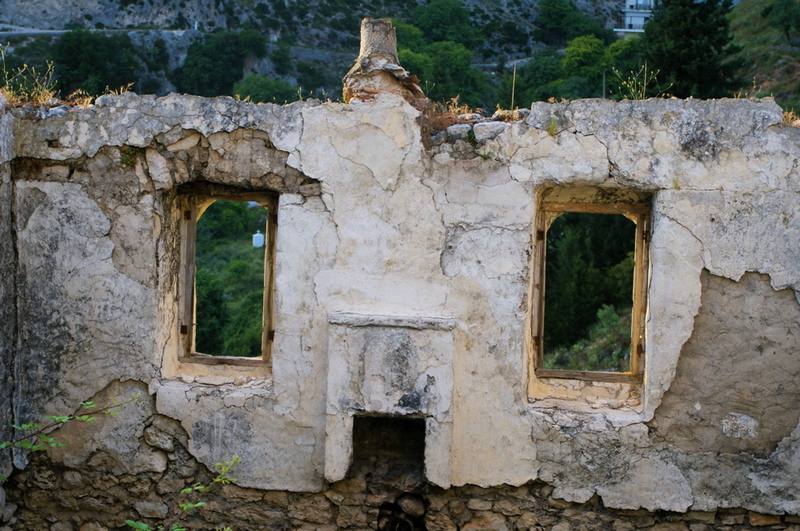 We moved on till we caught sight of a fantastic ensemble of seven or eight ruined buildings in a walled enclosure in full view of the sea and the island of Corfu in the distance. Goats foraged among the ruins. Cows mooed from within the ruins and foraged about outside on earth patched with cow patties. Then we caught sight of a man in a blue baseball cap with Greek lettering and a boy with a shepherd’s staff who stood on one leg next to a tethered horse. “A man,” said the shepherd. The shepherd fished out a plastic pop bottle from behind a bush and stuck it into a square hole in a concrete cistern, filling it up with water. “Have some water if you like,” he said. After we had drunk to our heart’s content the shepherd offered to take us to the man who lived on the hill. We followed him up a stony path, which wasn’t good for anything except horses, until we came to stone wall fringed sheep fold. The animals were gone. A couple of dogs slunk about outside. There was a plot of garden with some vegetables and a small stone hut from which emerged a pregnant woman with a clutch of small inquisitive children. The woman’s face was thin and sun-browned. “Will you have raki?” she asked, inviting us in and pulling up chairs. We said we would. We never said no to raki. The woman left and returned with a plastic bottle filled with raki and four shot glasses. Squatting on the earth beside us she poured us each a drink. The shepherd rolled a thick cigarette from a pouch of Turkish tobacco. His fingers were yellow and nicotine stained. He drank his raki avidly and then poured himself another while the children lined themselves up against the wall from biggest to smallest and stared at us intently. “We are coming from Czech Republic,” said Ivanović. “I would like to acquire this hill in order to set up a school” – for it had been decided that it was better Ivanović said he wanted to set up a school rather than say what he really had in mind. We drank more raki. The shepherd offered to grill a goat for us, but we declined. After we finished the raki we took a look around the ensemble of buildings. Many of the buildings bore faint traces of faded red lettering indicating that they had once served a military function. All of the buildings were in ruins and had fallen-in roofs, except for one white-washed building at the center which served as a chapel. The doors to the chapel were open. Cheap icons haloed in frills of gilt tin hung from the walls or stood on the altar next to a silver tray with snuffed out candles and some cushions. It smelled faintly of incense. Probably a priest came here once a week to light candles and say prayers. We strolled around the grounds until we found a path leading down to the sea. The water was especially blue and clear. Here we stripped down and went swimming. The water was ice cold and it took around five minutes before I could breathe normally. I bobbed in the water looking up at the snow-capped mountains towering above us and still shrouded in clouds that seemed to hover permanently over the mountains, but never moving to the shore. The entire length of our stay the clouds hung there, never moving. Never once did we get a glimpse of the mountain peaks, some of them over two thousand meters. After bobbing around in the water a while I swam ashore and lay together in the sand with the rest of the guys, our heads resting against a rock until I fell asleep. Back in Dhermi that evening we were presented with the catch of the day on a platter to inspect and choose from. Pavel had his heart set on lobster. “There is no lobster today,” said the waiter, who also doubled as fisherman. Fish was brought to us. We drank white wine. Pavel got drunk and expressed an admiration for one of the sand paintings on the wall. It was a picture of the beach and the hotel with an Albanian flag. “You like? 400 euro,” said the waiter. Pavel said he would take it. The waiter took the painting off the wall, not before kissing the Albanian flag affectionately. “It is a sweet thing,” said the waiter. The next day we drove down the coast to the town of Himera to talk with an official at the town hall to see what chances there were of acquiring the hill. We drove back up to the hillside village with the Greek graffiti, which stood nestled in a shady ravine. There were a couple Orthodox churches. Goats ambled across our path as we inched along through them, sometimes gently bumping them as they milled and bleated like a sea around the car doors. We stopped at a grocery shop for cheese and water. Inside the television was tuned to a Greek station. Goat’s cheese was kept floating in water in blue buckets on the floor. A clutter of odds and ends stood for sale under the glas counter in place of meat and cheese. “This is the kind of store that sells everything and nothing,” observed Luli. Ivanović Makes His Move. Well, He Tries. We passed a ramshackle village with some fine old Greek architecture and an old woman sat side-saddle on a donkey knitting. Himera was a more-or less modern seaside town. The town hall was Italianate in style. It was cool inside. I didn’t understand very much of what transpired between Luli, Ivanović and the official. An assistant sat smoking. A woman stood observing the discussion against the wall. Back outside Ivanović thought a moment. Perhaps I could be brought into the scheme somehow. “Better not mention the word ‘culture’,” said Luli. We strolled round the seaside promenade. We went to an internet café so that Ivanović could devise a proposal for the bishop in Tirana. He outlined his plans and brought me into the scheme, mentioning that I was an export on Balkan affairs. As we were leaving the woman who had stood by in the office approached us and suggested we talk with the unofficial mayor of Himera, who knew of some other nice properties. The unofficial mayor was promptly introduced to us, a curly-haired stocky man with a missing front tooth, who offered to show us two pieces of property in the vicinity. And so we drove together into the hills above Himera, stopping around fifteen minutes out of town at a bend in the road so that we could inspect another ruined monastery on a mountain top. We were somewhat less than enthusiastic about making the forty minute hike to the monastery. Owing to the property’s inaccessibility we decided to drive on to a second site, on a side-road with a splendid view of the sea. It was merely a plot of land with nothing on it, so not that attractive for Ivan. Ivan thanked the unofficial mayor for his time. He got in his battered Mercedes and drove back to Himera. We drove back to Dhermi, stopping along the way to meet the mayor of Dhermi who tried to sell us a hotel and an olive press, miscasting us as big spenders from the West with money to invest. The next day Ivanović drove Pavel to Tirana from where he would catch a plane back to Prague. 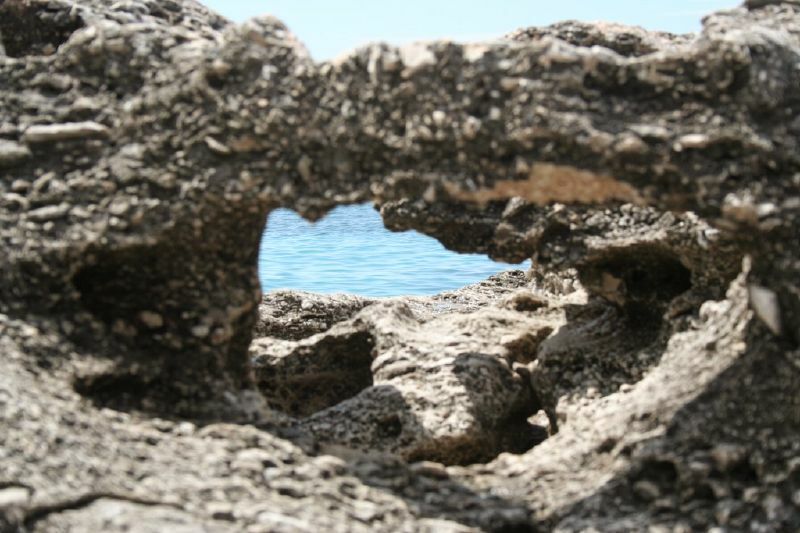 Luli and I spent the day together, setting out to explore the beaches north of Dhermi. Back at the hotel workers were sitting on the terrace drinking coke. They worked a couple hours a day, painting, laying concrete. The rest of the time the sat around drinking coke and coffee. Albanian folk pop blared from speakers. This was the music you woke up to in the morning. We took a table on the terrace. Under a thatched roof men sat eating fish with their hands. We took a table near a net full of freshly caught fish. Cats prowled about fighting for fish heads thrown to them by the men. An Albanian flag, an American flag and the flag of the European Union flew from the railing. Fishing boats bobbed in he distance. Beyond that the island of Corfu. The waiter, who also doubled as fisherman, arrived and asked us what we would have. Earlier in the day he had been pottering about in rubber boots helping the workers lay concrete. “The man simply does everything,” said Luli. We told him we would have fish. The waiter swaggered off in the direction of the kitchen. His upper body was stiff and erect. He wore his sleeves rolled up to his elbows, revealing bronzed, muscular arms. After a while he returned with a platter of fish and lobster. Luli pointed out the lobster, which was still twitching. After a while the lobster arrived. We ate it with squeezed lemon and toasted bread and a bottle of white wine. “We’re having lobster,” Luli gloated. “And I am in Prague with two Czech whores,” said Pavel. Ivanović showed up in the afternoon. He had seen the bishop in Tirana and had presented him with his idea for the monastery. “He did not say no,” said Ivanović. We spent two more days in Dhermi. We made another trip down to Himare so that Ivanović could use the internet café to work on his project proposal for acquiring the hill. I drank raki and watched the Albanian turbo folk videos on the TV while Ivanović worked. Then another raki. One of the guests stood me a third. “Where are you from?” asked the Albanian. “I am American,” I said. “As long as you’re not Greeks,” he said. Before heading back to our hotel we stopped at a café in a hillside village. The terrace was built on a cliff overlooking a ravine around which the village had grown. The thatched roof above the terrace was collapsing and old men with leathery sun-beaten faces sat around on plastic chairs smoking Turkish cigarettes. We drank raki. Inside the café men were complaining about the Greeks. Next the café stood another locale. That was the locale of the Greeks. An Orthodox priest all in black stood chatting with the patrons. “I don’t want to,” said Luli. In the end he was prevailed upon. Luli and Ivanović strode up to the priest and engaged him in Ivanović’s affair with the hill while I drank raki. Back to the table Luli explained what had transpired. Luli received a call on his mobile. It was Aphrodite. She had arrived from Vlorë and was at the hotel. Luli went to pick her up in the car while Ivanović and I sat on the terrace and drank raki. You could hear Luli as he honked the horn, rounding the curves. After a while he returned with Aphrodite. Her hair was dyed a further intensity of red. Luli befriended the proprietor, a big man with a hearty manner. He liked the fact that there was a boy from Kosovo here. We went back to the hotel and sat on the terrace. Luli beckoned to the waiter. “Is there a motor boat to be had?” asked Luli. “You must ask the police,” said the waiter. Following the waiter’s directions we found the police station next where two men in police uniforms sat on a second floor terrace chatting amiably in the sun. Luli hailed them from below. “Will you give us permission to rent a motorboat?” asked Luli. The police said they wouldn’t. They were touchy about smugglers heading off to Italy with contraband. We walked back to the hotel and Ivanović. The next day we decided to drive to Girokaster in the south, for the priest who was in charge of the monastery resided there. We drove south, along the same winding road to Himare, moving on to Saranda, a nice seaside town with a crescent-shaped beach, high-rises, palms and mosques, where Ivanović spent a couple of hours in an internet café working on his project proposal. I set off in search of a music store. It began to rain. The muezzin sounded. It was time for midday prayers. Back in the car we drove a further forty-five minutes to Girokaster. There were minor traffic accidents everywhere. Right outside Girokaster we passed a large lorry which had nosed its way precariously over a cliff. 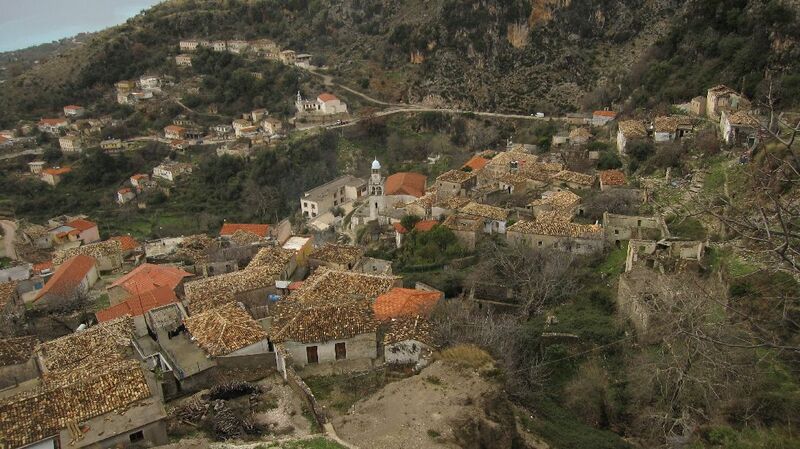 In Girokaster we found a spectacular hillside town situated under a mighty castle. Grey fortress-like houses clung like swallow’s nests to the slopes. Most of the houses were two of three stories high, built from solid blocks of stone. Some of the houses had out-jutting second stories in the Turkish style and grey slate roofs supported by wooden beams. Many of the upper story facades were decorated with red ornamental flower garlands and pictures of animals. The crooked, narrow streets were paved with cobbles, the kaldarma, which is the Turkish word for a cobbled street. Many of the buildings lining the streets were so decrepit and rotted away that they bulged and buckled, sinking quietly in their moorings and collapsing into each other. Some had shed their shingles, and tufts of grass sprouted in the rafters. Most of the ground floor shop-fronts were occupied by stores whereas the upper story appeared to be unused and boarded up with blown-in windows, when not used for storage. The old town was the ghost town of a commercial district while most of the inhabitants of Girokaster lived in newer socialist-era quarters towards the bottom of the hill. The most striking thing about Girokaster, however, was the Citadel, built by Ali Pasha after he captured the town in 1811. The Citadel broods over the town and is visible from a long distance away. Upon entering the town, which has a sleepy, lost-in-time feel, we stopped to ask directions to the Orthodox church. A man with a large protrusion on the back of his neck and a dark mole under his left eye motioned the way, urging us to follow him. His job, he said, was fixing up old churches; he had to pay a visit to the church anyhow. We followed him down a narrow cobbled street lined with low houses with blown in second story windows to the Orthodox church. Trying the door, we were told that the priests were sleeping and to come back in an hour. So we left and went back to the main drag where we found a restaurant called ‘Festival’ with high beamed ceilings and a mosaic of dancing Albanian folk in traditional costumes. We sat down and ordered wine and perused the menu. The waiter was a young boy, very correct, and dressed in black with a red bow-tie. We ordered several dishes and ate till it was time to meet the priest. Ivan and Luli left, leaving Aphrodite and I in the restaurant drinking raki. Upon their return we were informed that the priest was not present, but that the assistant would be available the next day. In the time being they had been given a lead about a hotel. The hotel was just down the street, on the main square. It was unmarked from the outside. A picture of Mecca hung in the hallway while kitschy landscapes fashioned somewhere in the Muslim world adorned the rooms. From our room we could look into a pool-hall opposite. Luli was tired and wished to sleep, so Ivan, Aphrodite and I took off to explore the town. It was dark and a faint drizzle hung in the air as we walked up the slippery cobble stones leading to the Citadel. Young Muslims were filing into the mosque under the Citadel to pray. The lights of the town twinkled below. We walked through a dark tunnel cutting under the Citadel, then climbed a series of steps to a gateway which was bared and guarded by a barking dog. As we approached an old man opened the gate and let us in. The man took us through a dark, high-vaulted hall, flashing his pocket light at guns and tanks used by the Partisans here exhibited as part of the Albanian National Weapons Collection. Water from a cistern gushed somewhere behind thick walls. The man recounted the history of the castle, beginning with Ali Pasha. He spoke about the war and the Germans. This was news to me. But then you heard some strange tales in Albania. “Are you a Catholic or a Muslim?” the old man asked Aphrodite after he had pronounced an admiration for the people of Kosovo. “I am an atheist,” said Aphrodite. “Then you are a Muslim,” said the man. We thanked the man for the tour and walked down the hill to our hotel. The next morning awoken by the muezzin I got up early and set off for a walk while the others slept. Encountering the man from the day before who renovated churches, I was invited for a coffee in a café decorated with the same kitschy landscapes that adorned our rooms in addition to a poster of Michael Ballack. Later I ate brain soup in the restaurant with others. After meeting with the priest’s assistant we left Girokaster. We drove back to Dhërmi, checked out of the hotel and drove up to the hillside village to meet with the proprietor of the hotel who had promised to invite us the previous night. We drank raki and were treated to endless dishes of olives while I spoke with an ex-submarine captain who loved America, as everyone in Albania seemed to. The next day Ivanović, Aphrodite and I drove Luli to the airport in Tirana and then went on our way to Skopje, where we intended to deposit Aphrodite, who would then the next day board a bus to Prishtina. This report was originally published on Robert’s site EXPORT – IMPORT. Read more of his stories also on Balkan Stories Blog.